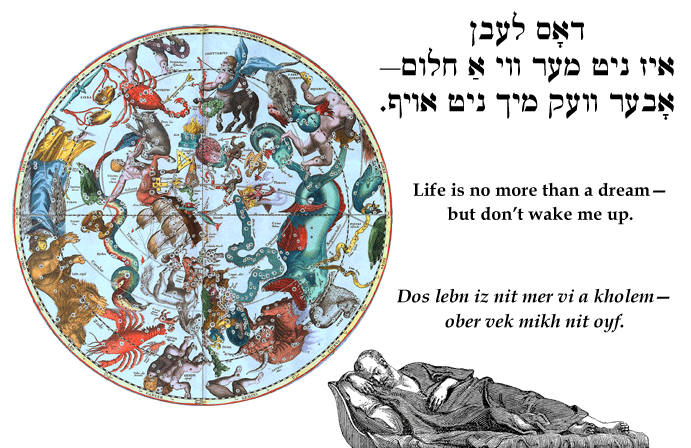 Yiddish Wit: Life is no more than a dream—but don't wake me up. דאָס לעבן איז ניט מער ווי אַ חלום—אָבער וועק מיך ניט אויף. Dos lebn iz nit mer vi a kholem—ober vek mikh nit oyf. Life is no more than a dream—but don't wake me up. Di gantse velt iz a kholem—nor beser a guter kholem eyder a shlekhter. The whole world is a dream—but better a good dream than a bad one. Di gantse velt iz a kholem un der toyt iz der pisren. The whole world is a dream and death is the interpretation. Compare the story of the Chinese Taoist philosopher Zhuangzi (莊子), who dreamt that he was a butterfly, then awoke to consider whether he might be a butterfly dreaming that he was a man.